WHAT Willie Henderson lacked in stature, he more than made up for with talent and tenacity. Just 5ft4 tall, Glasgow-born Henderson joined Rangers in 1960 and went on to spent a dozen years at Ibrox as a flying winger of some repute. 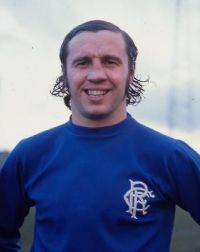 He would prove to be a key figure in Rangers’ successes of that era, including winning the treble in 1964, although he would depart just months before the club lifted the European Cup Winners Cup in 1972. There were spells at Sheffield Wednesday and a myriad stints overseas – in South Africa, USA, Hong Kong and Australia – before Henderson hung up his boots with Airdrieonians in 1979. Scotland was lucky to have in the same era two terrific wingers in Henderson and Jimmy Johnstone, the pair striking up a friendship despite being on opposite sides of the Old Firm divide and vying for the same Scotland jersey. Henderson went on to amass 29 caps, scoring five goals for his country.